Before The Hatter hangs up his hat later today (perhaps forever?) with a show at 8:15pm, I wanted to add here my emailed responses to a rather well thought-out email interview/preview I had with Matthew at The Marble. 1. Well it’s been a while since The University of Victoria’s Phoenix Theatre Department. What have you been up to since then? I have been off in the great wide world! 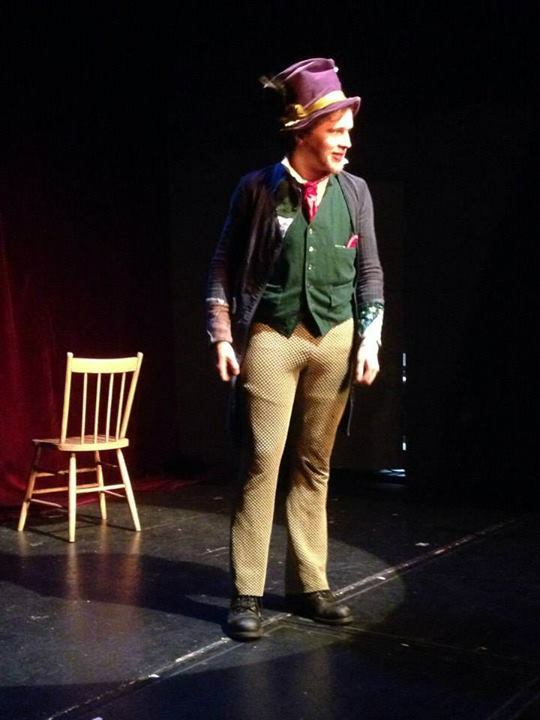 By which I mean, in the past three years, I have moved to the mainland, performed in 26 different productions for at least 16 different companies, taken three self-written one man shows (William vs The World, The Hatter, and The Most Honest Man In The World) to fringe festivals across the country (Victoria, Vancouver, London, Ottawa, Toronto, Saskatoon (x2), Port Alberni, and Regina), directed a talent show and a new fringe musical, got nominated for an Ovation Award, was picked as one of Richmond’s ‘30 under 30’, stage managed or ASMed for five productions, had a story make it onto CBC Radio’s Definitely Not The Opera DNTO, acted in a couple of no-budget films, and learned the true meaning of Christmas. Okay, maybe not that last one. Oh, and I have a half-dozen or so part-time jobs that pay my rent and let me disappear whenever I get a theatre gig. Phew! 2. That Hatter’s been following your around a lot in the last few years (or at least that’s how it’s looked whenever I’ve had a chance to peak into what you’re doing.) How did the two of your first cross paths? 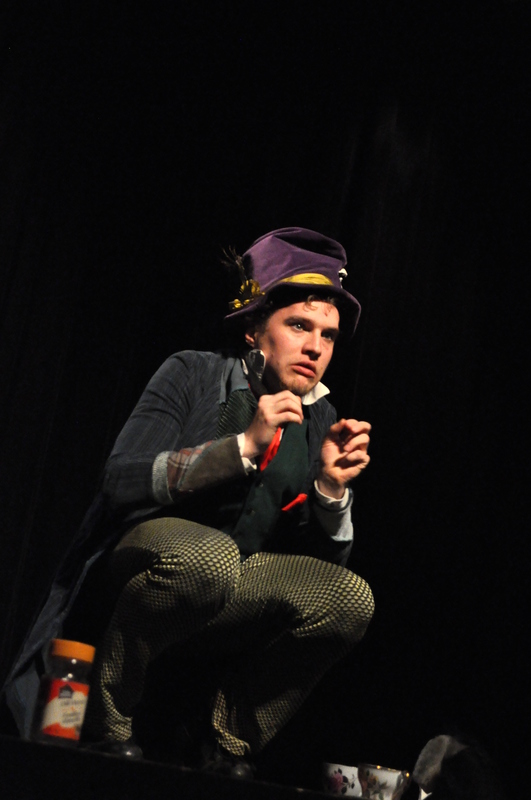 The Hatter and I actually first met at The Phoenix at UVic! A directing student, Rene Linares, asked myself, then a mere writing student, and Marynia Bienkowska-Gibbs (another writer), if we could write for him a play about Alice returning to Wonderland as a professional woman. This became a SATCo production. So we did! And as we wrote it, I found myself really connecting to The Mad Hatter, really enjoying writing for him. So when it came next to write a new one man show, there was a satisfying hook there. 3. I was tickled pink at the mention in your press release that you’ll be exploring the character’s, “serious emotional problems,” which could neatly sum up several personalities in the Alice series. Tell me, how much have you taken from the source material and what did you expand on? In the story, Alice is rejected by many of the characters in Wonderland, and does all she can to escape it in turn. But what if someone landed in Wonderland, and never wanted to leave? And what if they were forced to go? But what about a character who has moments like that occurring throughout his life? 4. What’s the most surprising thing you’ve discovered in your developing of the character, the most frustrating and, finally, the most fun? The most surprising thing about the character of The Hatter, for me, is how desperately he wants everyone to be happy and jovial and delighted and wonderful. Figuring that out turned the show from a variety act into a story of a man trying his hardest to host a silly, happy party, but everything keeps going sideways. The most frustrating part has been trying to connect this character with a wider audience. He looks like his should be a show for kids. But it’s not. Out of the first four performances I had in the London Fringe, the first time I really got the show on its feet… only one of those four performances had any purchased tickets. The tour picked up from there, but aye, a somewhat terrifying start. How can people know how good this show is, if no one comes? The most fun part of developing this character, for me, is that he dives into everything, 100%, be that leading a singalong, telling a poem, summoning a Jabberwock, or trying to improvise a silly song on his own. Nothing quite works out the way he wants it to, but it is so much fun to give it a go. Also, I love those moments – such as when they have to step over broken plastic cutlery to get to their tea – when audience members realize that this isn’t a show like anything they’ve seen before. 5. The last time I saw you at the Victoria Fringe (2011) you were directing one show, acting in another and assisting in another. You looked savaged by the time it was over, but (other than the merits of organization) I’d like to hear what you took away from the experience and how you feel about your return to Vic Fringe? I am SO looking forward to coming back! I consider this whole summer my home-coming tour in many ways; I’m returning to Saskatoon (where I had a 4.5 star review last summer), heading back to Victoria (my home for seven years), and then back to the mainland. And as for the mad experience of directing, stage managing, and writing/performing three different fringe shows at the same time, all I can say is, when I graduated, I was sorely worried that I wouldn’t get chances to work on theatre in the real world, so I made certain to say yes to every opportunity that came my way. I still, mostly, live that way, and I don’t regret that decision in the slightest. Gotta be at the edge of your abilities to really grow and improve and evolve. 6. Tell me more about the actual show, what’s in store for the Mad Hatter? 7. Now that’s you’re several years out of theatre school, I’d really like to hear your retrospective as well as any advice to young people starting up there or about to graduate and go into the big wide theatre world? Be rabidly ambitious, endlessly cooperative, and calmly patient. Very few careers in this world happen right out of school, regardless of the field. Never mind in such a frivolous and amazing arena as theatre. But know that the theatre communities out there are full of people who want to help you, who want to support you, and who would love some support in turn. Find those rent-paying jobs that offer up the flexibility to let you keep pursuing what drives you, excites you, fills your boots with glee. And ask the elders… pick the brains of the theatre people around you and find out where they get their opportunities, where they want to go next. 8. So as a performer, is there anyone you’d say you took inspiration from more than others? Oh, inspiration comes from all over. Sometimes, the reassuring kind, where older actors tell me how much easier it is to find work when you’re one of the four 70+-year-old actors in town, rather than one of a million 20-somethings. At other times, the blistering heat of coming across someone who is so pumped up to get to be doing what they’re doing. Or the reasonable kind, seeing how actors pay the bills and getting that calming feeling of ‘I could do that’. 9. 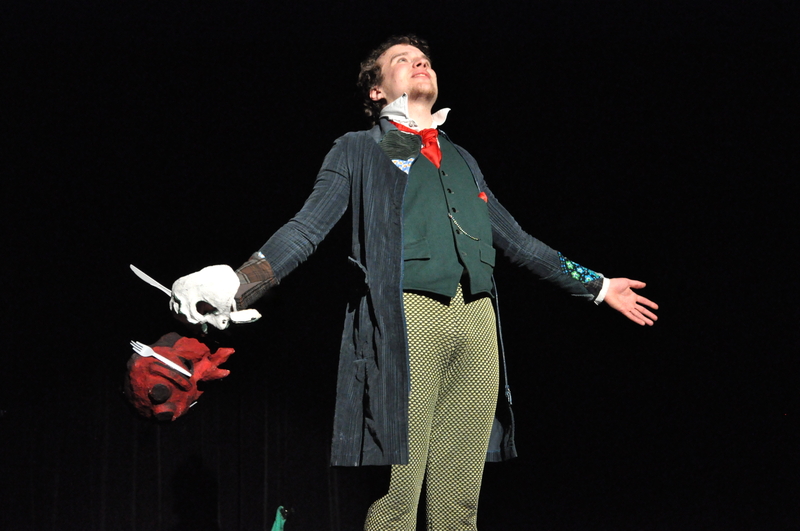 Distilling it all down, why should folks come and see The Hatter? 10. Finally, what tea can patrons expect to be served? It’s The Mad Hatter’s tea party! You’ll have dozens of options to choose from, and even some mustard and relish if you want to add a condiment or two. See you at the tea party!